Quickbar provide managed licensed bars with fully trained staff. 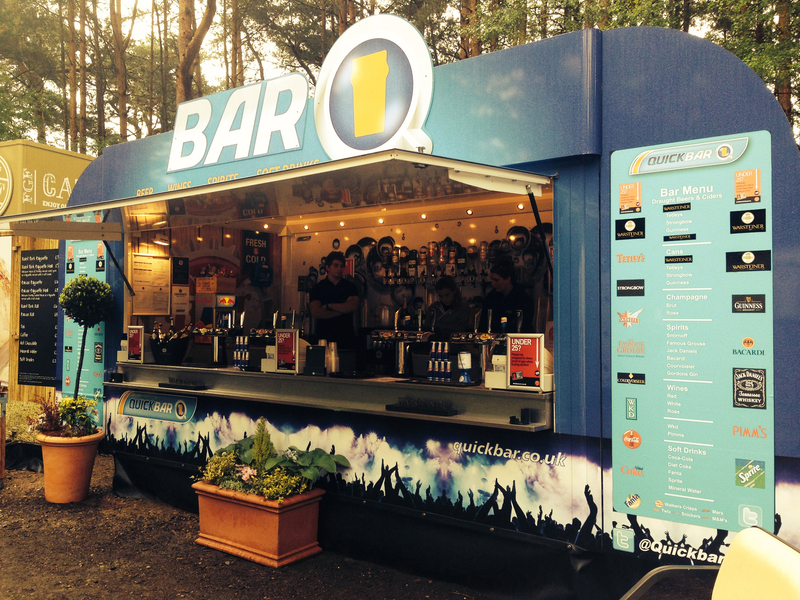 We have provided fully staffed and managed mobile and marquee licensed bars at many major events and venues. These include; F1 British Grand Prix, Moto GP, PGA European Tour Golf, The Grand National, The Cheltenham Festival, The Principality Stadium, Wembley Stadium and Twickenham. Our Trailer bars are fully fitted with state of the art equipment. This enables us to provide an efficient mobile bar which is capable of high volume sales while providing a professional service. If you have any specialist or branded bar requirements we can supply these for hire at any event. These bars can come fully staffed and managed if required. We can design our marquees to fit your specific requirements accommodating any size or branding needs. These will provide high volume sales in a fully customised marquee. All of our bars are available to be hired on a dry hire basis and can be provided fully managed and staffed. We can provide the complete mobile bar solution including PDQ and Epos services. These allow us to maximise your income, help to improve customer interaction and to provide full transparency at your event.